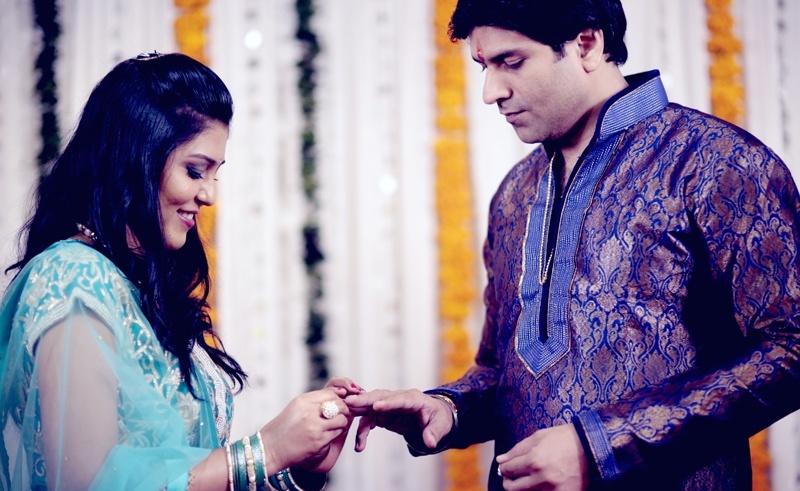 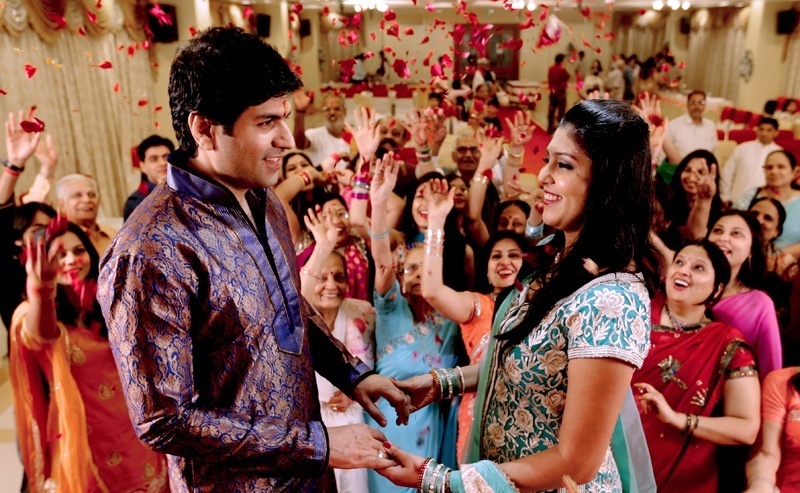 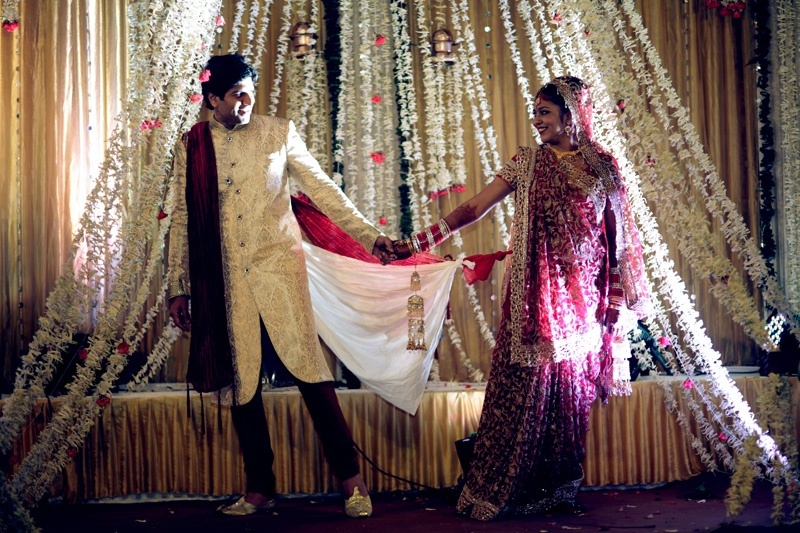 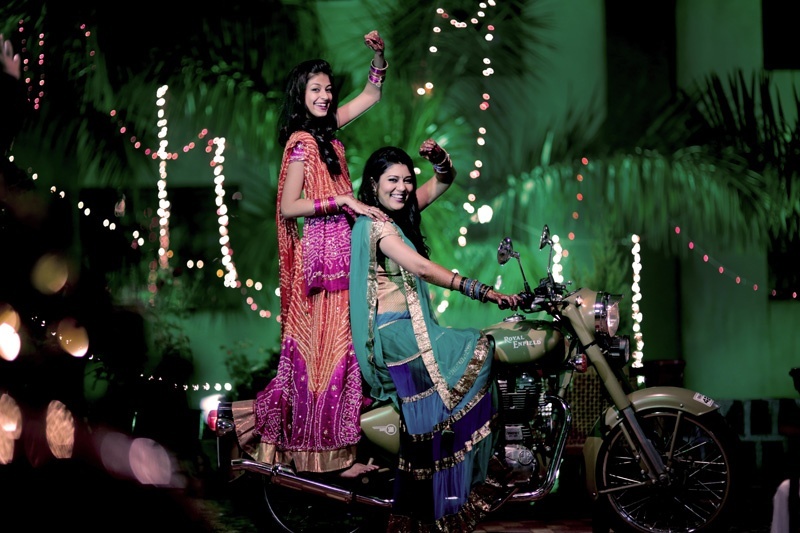 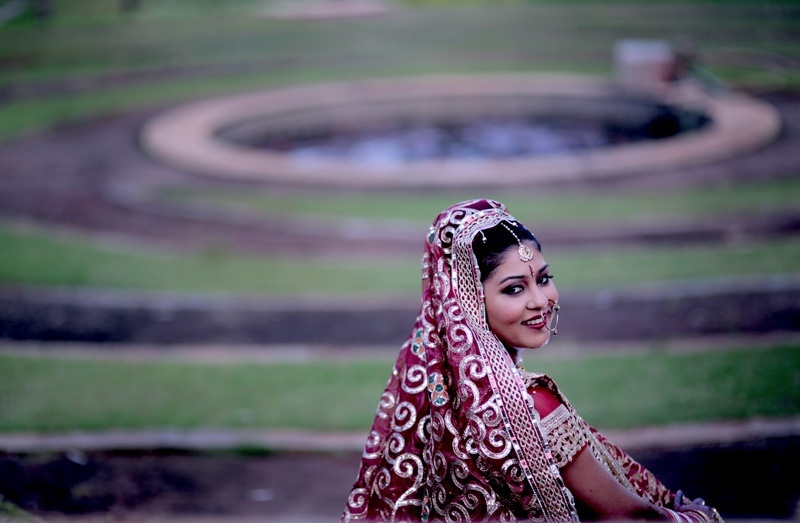 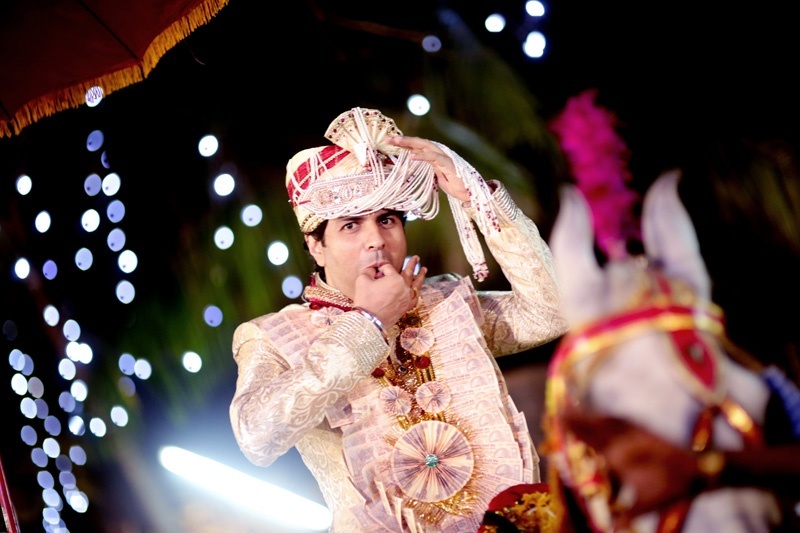 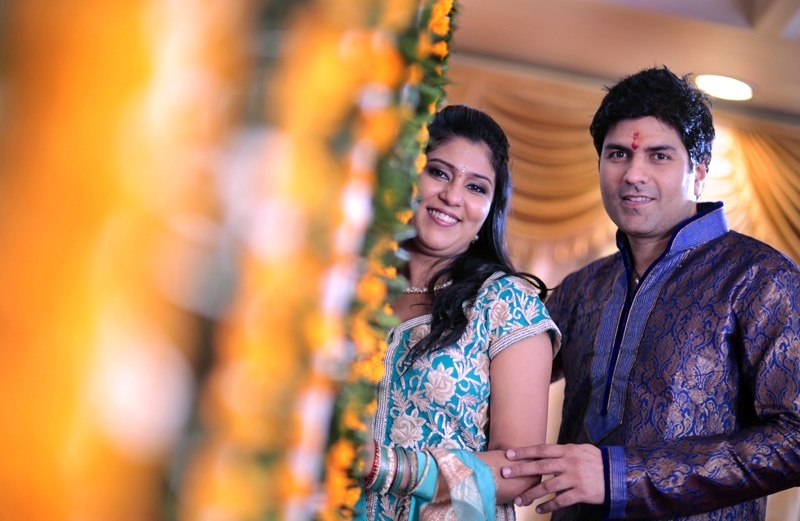 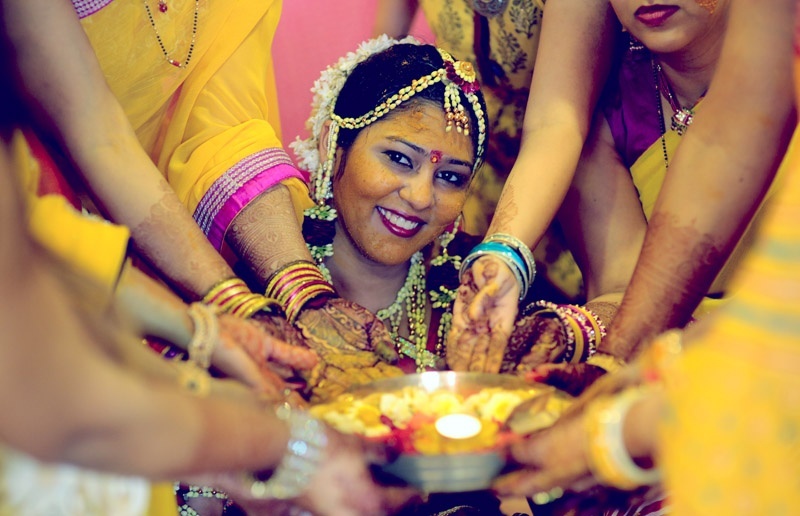 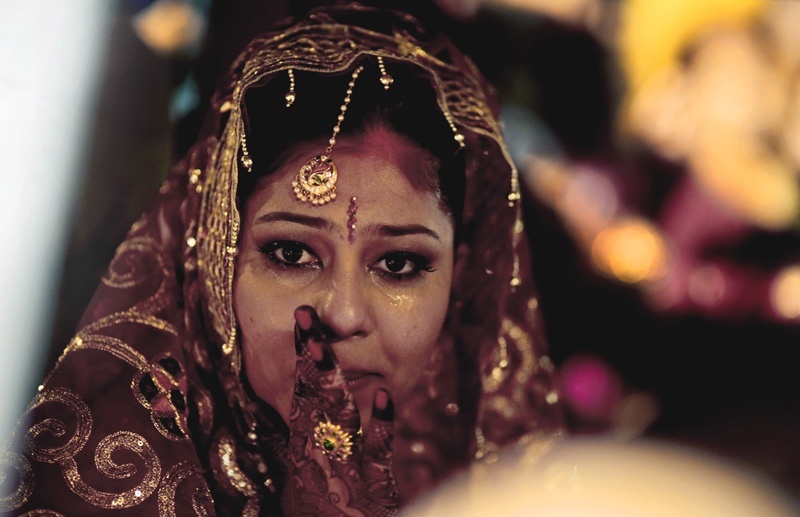 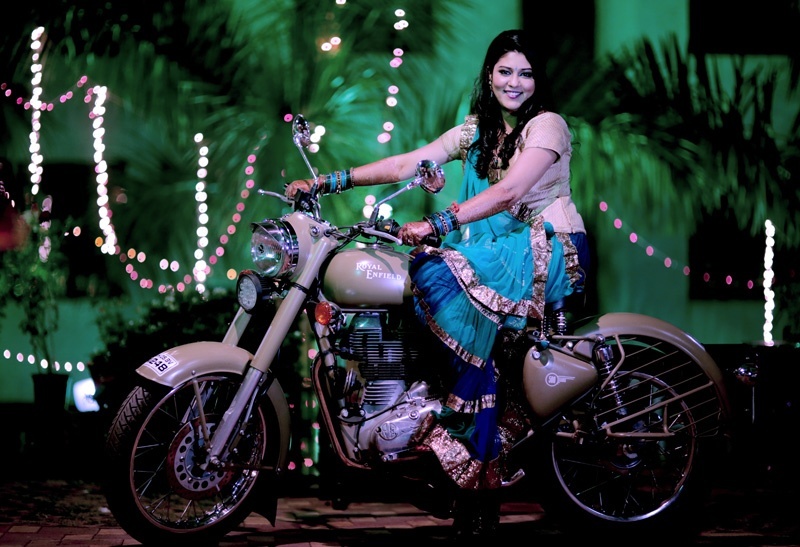 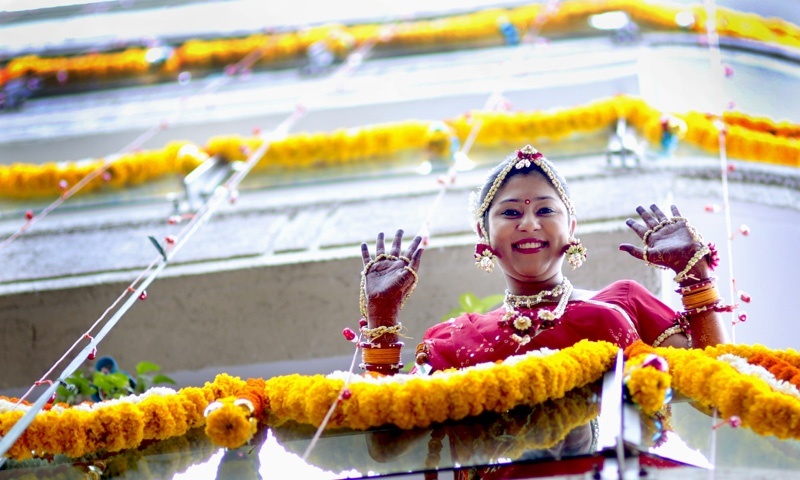 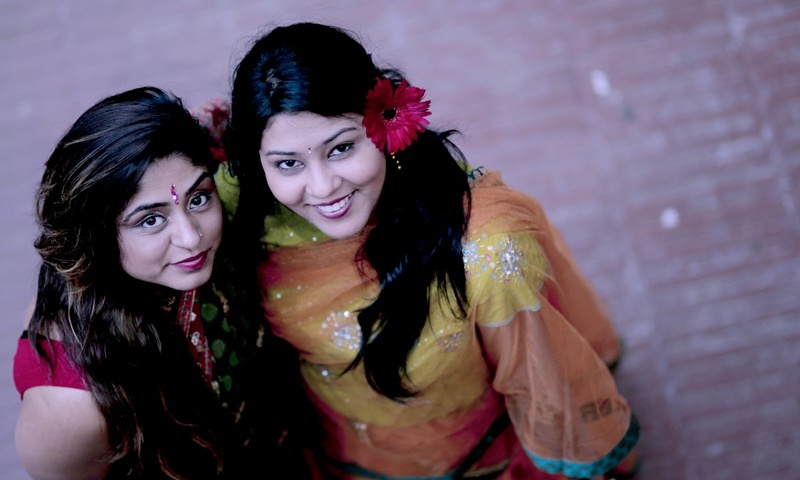 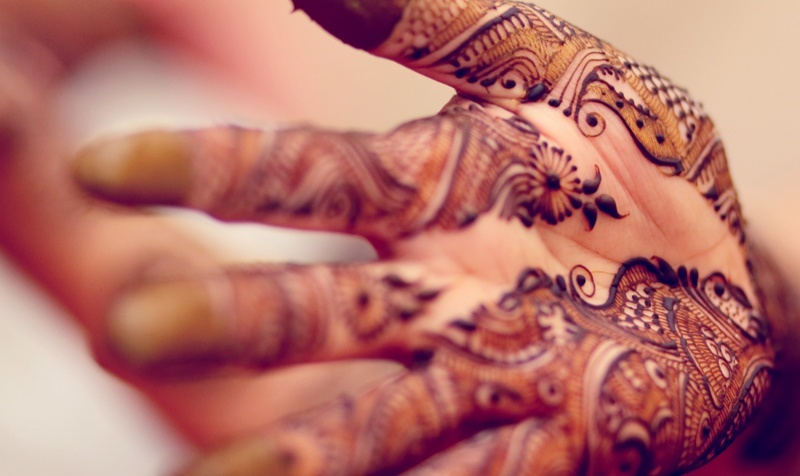 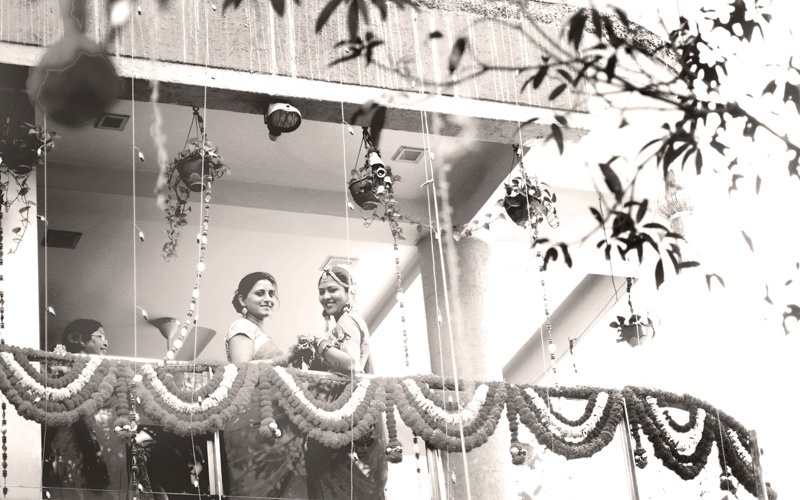 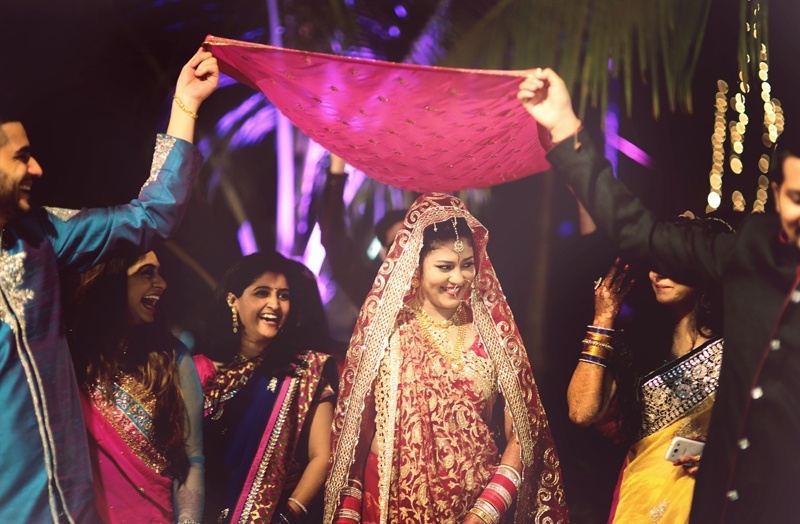 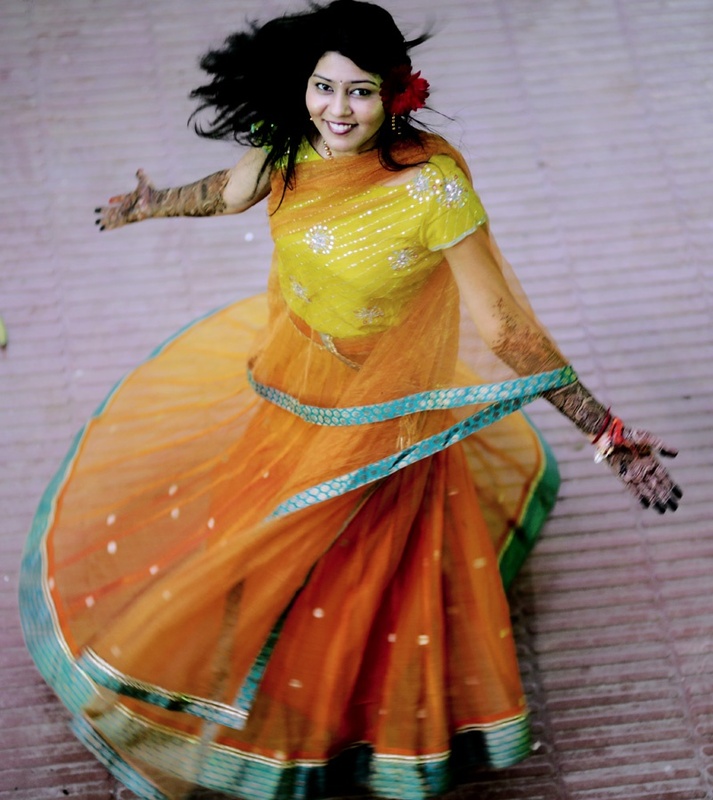 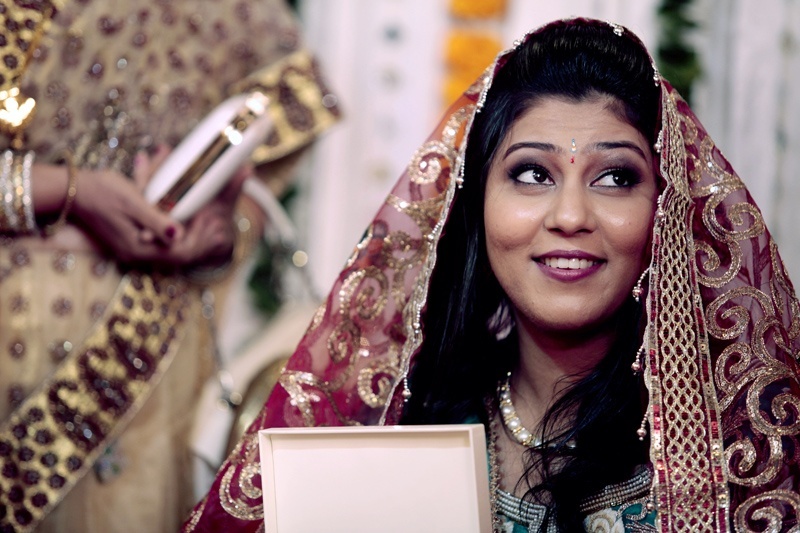 Neha and Aman’s union was a perfect blend of traditional rituals and unconventional ceremonies. 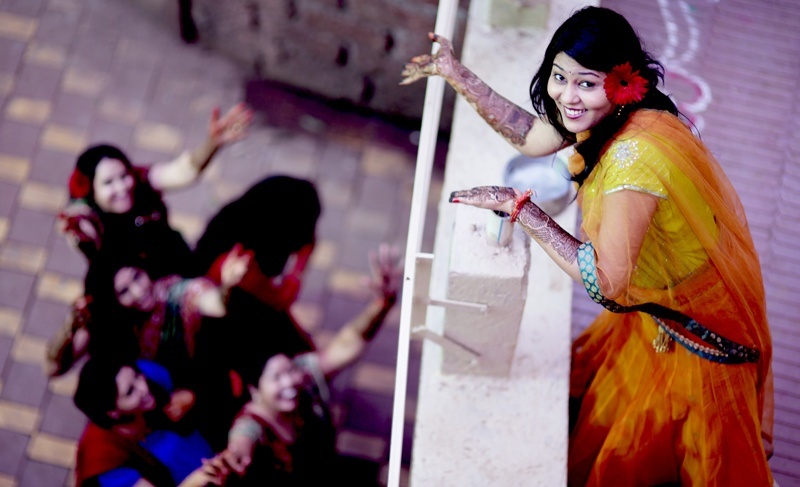 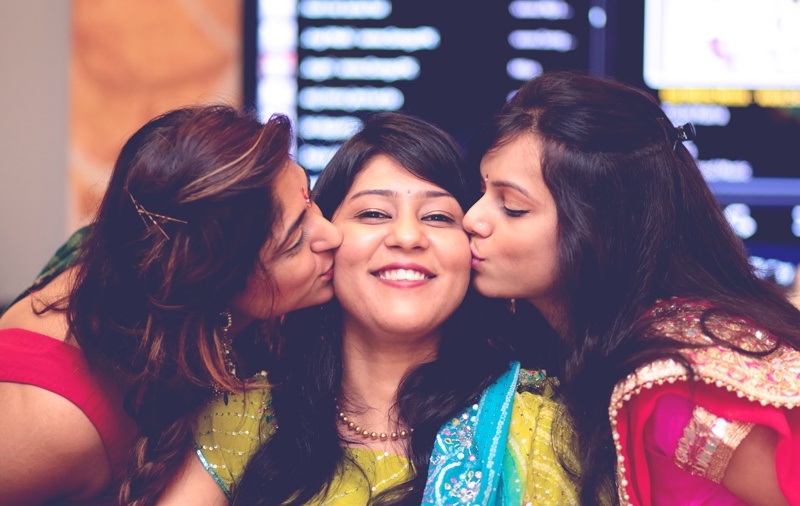 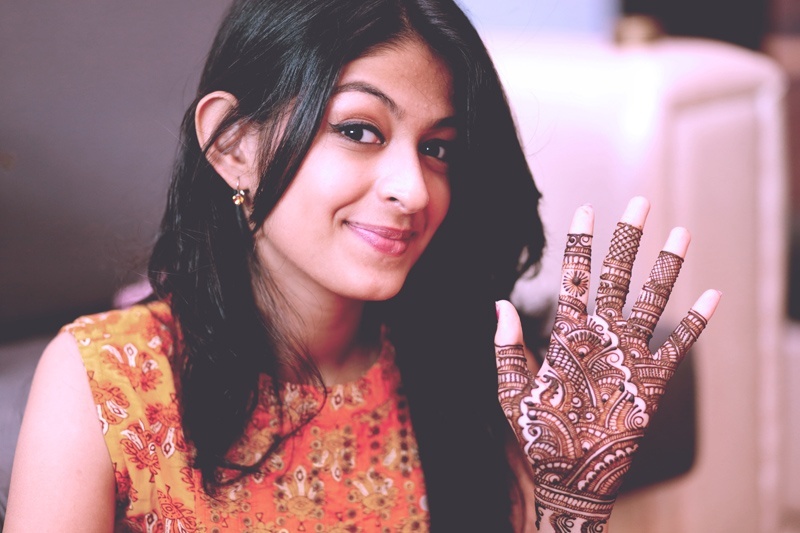 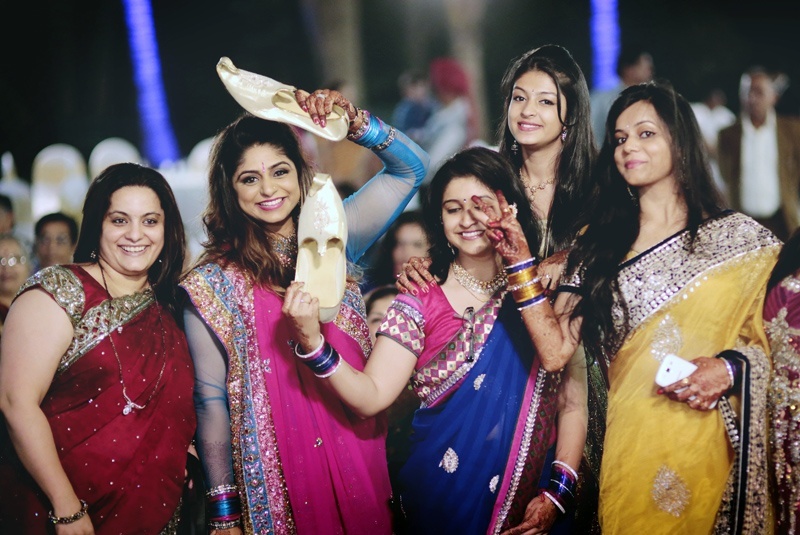 Their wedding celebrations unfolded in multiple phases with a colorful mehendi function, traditional haldi ceremony, a classy engagement held inside a banquet hall and then finally, the Big Fat Indian Wedding! 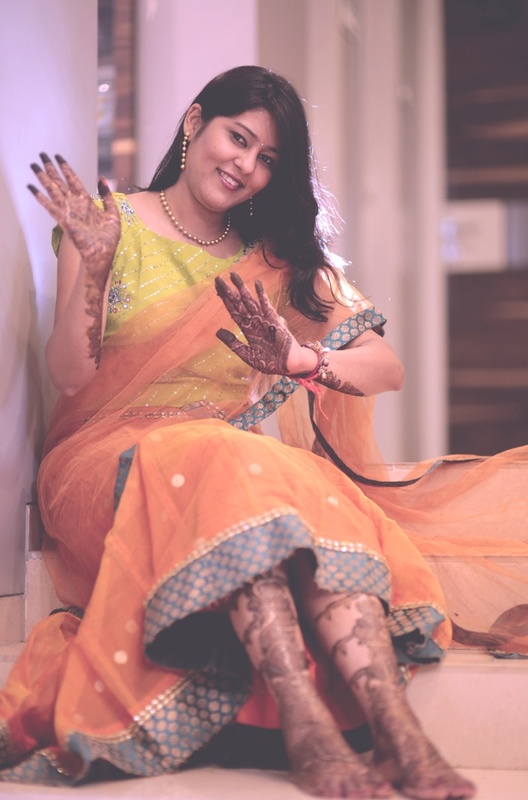 With intricate Indian mehendi designs on her legs and feet, Neha wore a lime green blouse and orange lehenga that had beautiful sequins work. 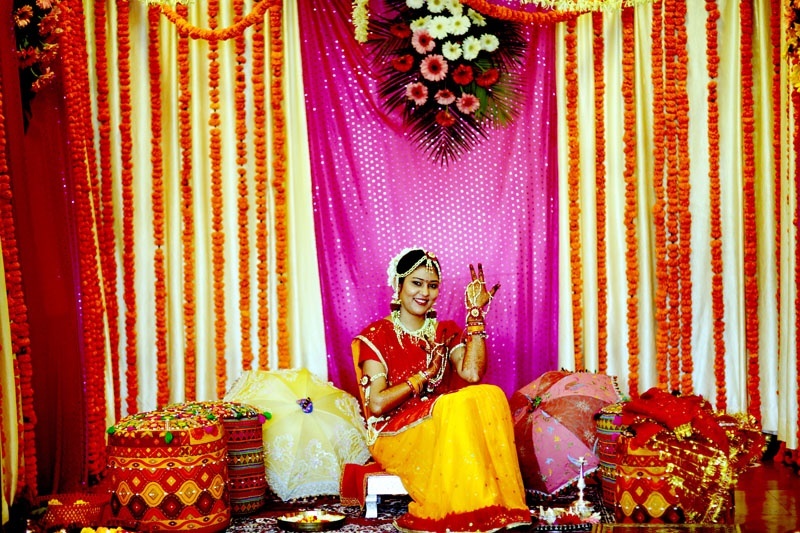 At the haldi function, she wore a crimson and marigold yellow Gujrati styled saree and wore attractive floral jewellery like, a fresh flower haath phool, a beautiful mathapatti and floral earrings. 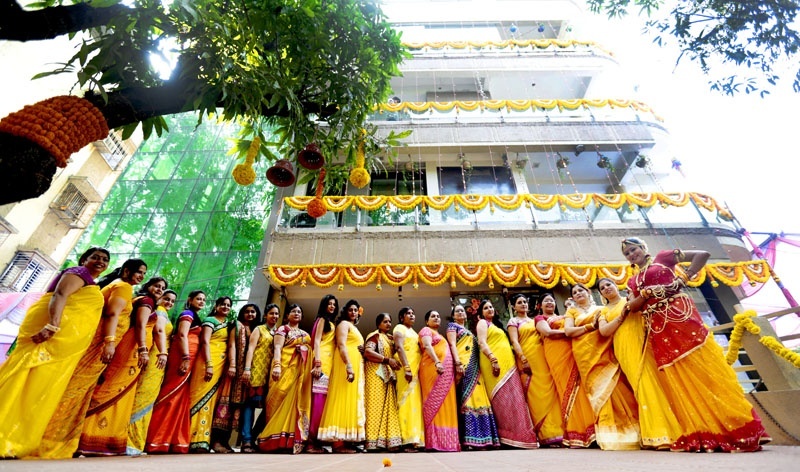 The bride’s family and friends dressed in colour coordinated sarees. 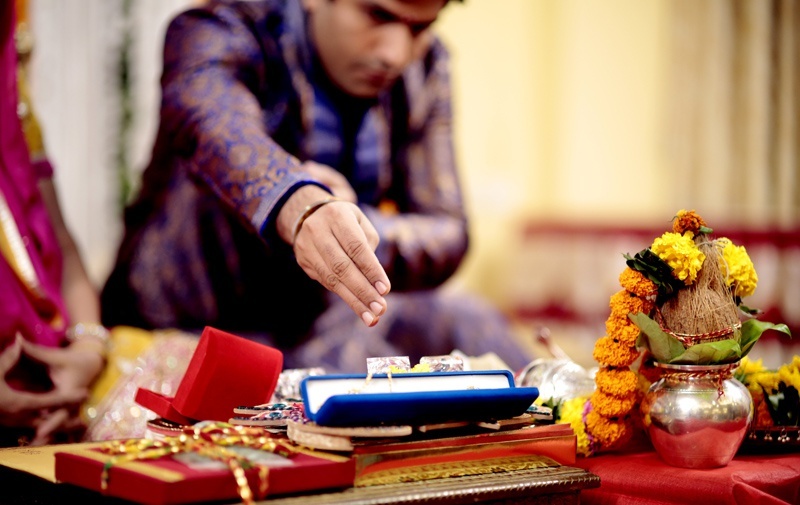 For the engagement ceremony, Aman looked dapper, dressed in an ink blue and gold brocade kurta. 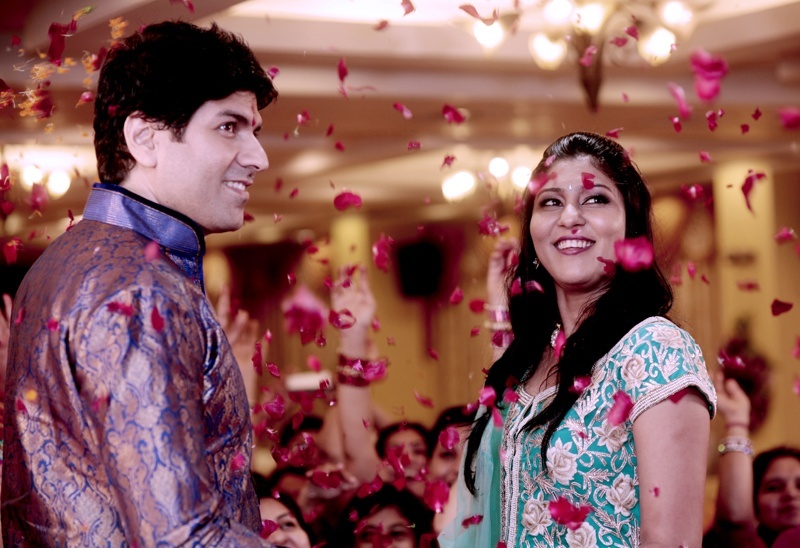 As soon as the couple exchanged rings, they were showered with beautiful rose petals by all of their family members and loved ones. 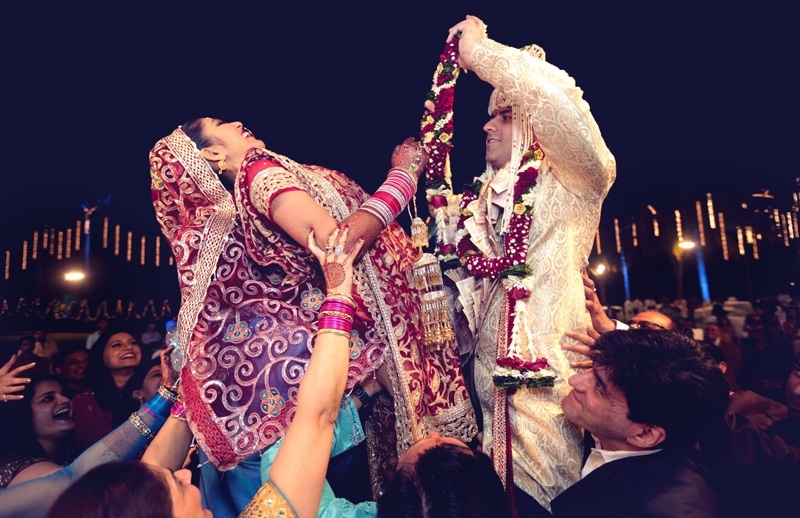 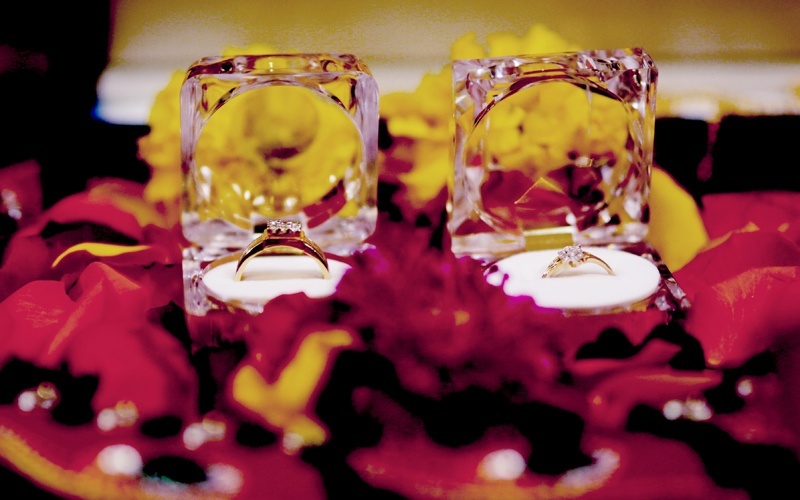 Once the rings were exchanged, and things were made official, it was now time for them to tie the knot in an extravagant way. 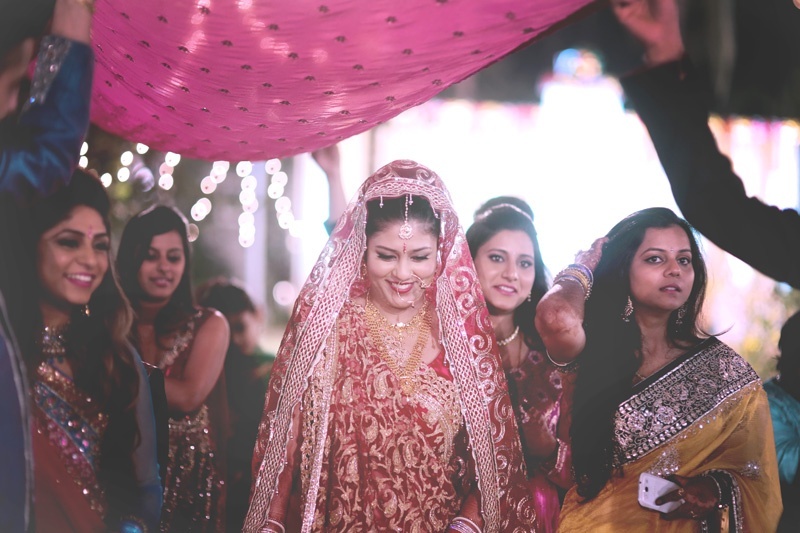 With a bridal chaddar over her head Neha entered draped in a beautiful red bridal saree embellished with gold sequins, she took slow and dainty steps towards the wedding mandap where Aman waited for her with bated breath. 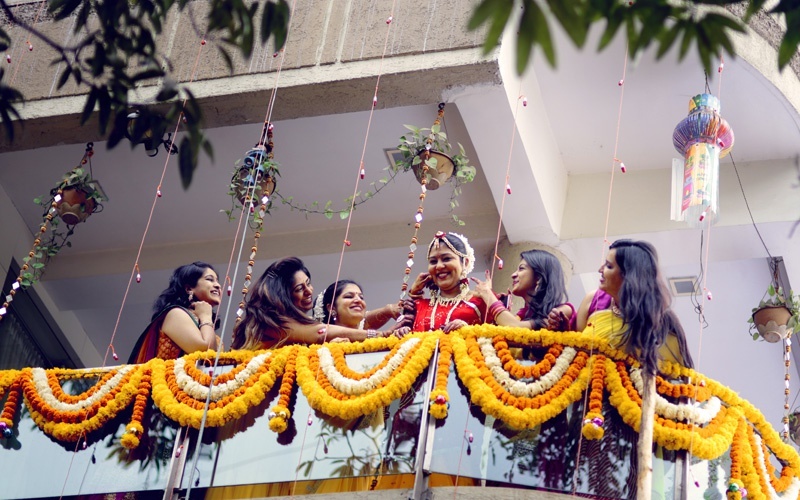 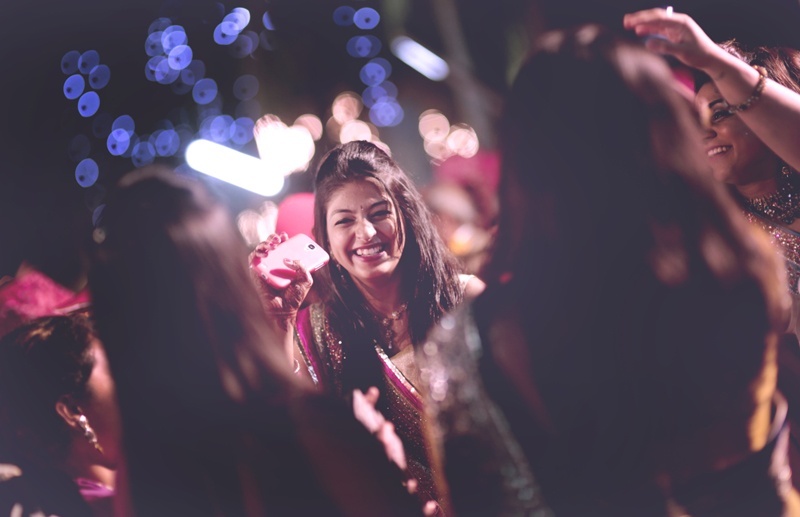 From the glowing smile on Neha’s face, the resplendent wedding décor, to the candid photo sessions of the bride and the classy wedding atmosphere, Sandeep from CreativEyes, made every moment unforgettable with his creative clicks!